That one-day cricket is completely a batsman-oriented game is emphasized by the fact that its rules impose restrictions on the bowlers. A bowler can deliver only a fifth of the total number of overs that his team is supposed to bowl. This leaves the captain of the fielding side with no option but to rotate his bowlers. While doing so, he has to take into account factors like the match-situation, the state of the wicket and the quality of the batsmen at the crease. Generally, the best bowlers are used in the first few overs and the last few, although the decision is also based on the form of the bowlers. It's not always the efficiency of the bowler, but the effectiveness that dictates bowling changes. Shoaib Akhtar might be the most popular Pakistani bowler, but they does not necessarily make him the most effective. Mohammed Sami, Abdul Razzaq and Rana Naved-ul-Hasan have fared far better than him in recent times. Even if Shoaib returns to the Pakistani side tomorrow, Inzamam-ul-Haq will be more inclined to entrust the responsibility of bowling in the 'death' overs to his three colleagues. Of course, there are times when 'shock' strategies work. New Zealand provided the classic example of the same when they opened the bowling with off-spinner Dipak Patel in the 1992 World Cup. Considering that everything is so heavily loaded against them, it is not surprising that bowlers are under more pressure in an ODI than in a Test match. A bowler who fails to strike form in an ODI will be brutalized. His woes will be compounded if his team lacks all-rounders and has gone into the match with only four frontline bowlers, like the current Indian outfit. This means that whether he or his captain likes it or not, he will have to complete his full quota of overs, regardless of whether the batsmen have taken a fancy to his bowling. The only way out in such a situation is to keep calm and rethink one's strategies. Sticking to the basics and not experimenting will help. A case in point was Venkatesh Prasad in the 1996 World Cup quarter-final against Pakistan. After some expensive overs, he made up his mind to bowl straight and attack the stumps, and ended up castling the dangerous Aamir Sohail. Most captains look to preserving their main bowlers for the 'death' overs. The type of bowling really doesn't matter. 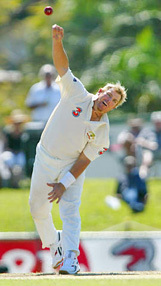 A paceman like Glenn McGrath is a real asset for Australia at the 'death', as was leg-spinner Shane Warne before he retired from one-day internationals. However, this tactic of 'preservation' could backfire in the odd game, as a bowler can find it difficult to regain his rhythm after being out of the attack for some time. There can also be times when the slow bowlers need to be given more overs to finish off the innings within the stipulated period, although they may not be in the best of form. The mind game between the batsman and bowler is all about out-thinking each other. The batsman should be pressurized to make a mistake. The best way is to choke the scoring. This strategy works equally well while bowling first or second. If the batsmen are allowed to settle down and score freely, there will be no pressure and they will be able to build their innings. Bowlers and fielders should not only aim to deny boundaries and sixes, but also prevent rotation of the strike. Of course, this is easier said than done against batsmen like Adam Gilchrist and Virender Sehwag, who can murder any attack. But it is still possible if the bowler 'bowls to his field' on one side of the wicket. If nothing is working, then the bowler should experiment with slower deliveries and the odd quick yorker. In this cat-and-mouse game, the batsman sometimes walks down the pitch or creates room for himself to unsettle the bowler. It is all the more important for the bowler to stick to his plan while sticking to the basics. In the death overs, a bowler should concentrate on yorkers and full-length deliveries rather than on good-length or short deliveries. The pitch, and a positive mindset: Everyone is well aware about the type of pitches that are used in ODIs. They are belters, tailor-made for batting. The greatest of bowlers have been mauled in ODIs at some point in their careers on placid tracks, especially in the Indian subcontinent. A bowler who retains a positive outlook and focuses on making the most of the resources at his command will be more successful than someone who cribs about the lack of life in the pitch.